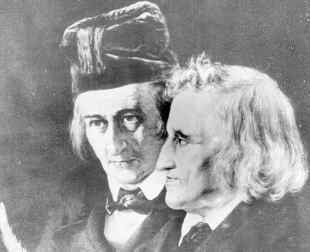 The Brothers Grimm, Jacob (1785-1863) and Wilhelm (1786-1859), were born in Hanau, near Frankfurt, in the German state of Hesse. Throughout their lives they remained close friends, and both studied law at Marburg University. Jacob was a pioneer in the study of German philology, and although Wilhelm's work was hampered by poor health the brothers collaborated in the creation of a German dictionary, not completed until a century after their deaths. But they were best (and universally) known for the collection of over two hundred folk tales they made from oral sources and published in two volumes of Nursery and Household Tales in 1812 and 1814. Although their intention was to preserve such material as part of German cultural and literary history, and their collection was first published with scholarly notes and no illustration, the tales soon came into the possession of young readers. This was in part due to Edgar Taylor, who made the first English translation in 1823, selecting about fifty stories "with the amusement of some young friends principally in view." They have been an essential ingredient of children's reading ever since. Fairy tales of the Brothers Grimm.